Great question, often posed to me by my NYC personal training clients and the answer is: it depends. Carbs are a non essential nutrient, so you need zero grams, since the body can produce its own glycogen from fats. So, no carbs ever, case closed? Regardless which model you follow, you will need to be in a calorie deficit. Once your calories are set (you can refer to an older newsletter here), you put protein at one or one and a half grams of bodyweight, leaving the rest of calories to be filled with fats and carbs. So, if you are in between going low carb or low fat, how do you know which one is for you? On the most basic level, some carbs are needed to prevent muscle breakdown and lowering cortisol in athletes in training. For that function alone, I would say 50 to 100 grams a day, would be the absolute minimum. Carbs also contribute to performance and recovery from workouts. Every 2 sets require 5 grams of carbs, so the typical 20 set-workout would put you at 50 grams of carbs. Added to the 100 grams baseline, the final number is 150 grams of carbs. Now, that is still a rather low number since we are talking anywhere from 100-150 grams of carbs on a training day. For a 200 lbs individual, that means consuming 0.75 grams of carbs per lbs of body weight. How much higher can you go? It really comes down to individual and his/her insulin efficiency. Here is a highly unscientific test for you. 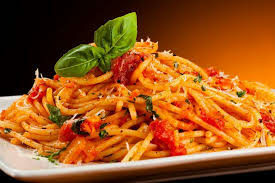 If you eat a bowl of pasta, do you feel ready for a nap or ready for war? If the answer is war, you can up your carb intake to three grams per pound of body weight a day, if your goal is to gain muscle mass. For fat loss I would stay around 1-1.5 grams per pound of bodyweight. If you fall asleep after a starchy meal, you most likely need to get a tad leaner before eating more carbs. Always keep in mind carbs are like nuclear energy: used properly they will put the Empire State building in beautiful Christmas colors, used incorrectly… kaboom! Previous post: When carbs strike back! Next post: We all sabotage ourselves!